It’s late July, 2018. In the Middle East, 800 men and their families are heading for Western Europe, Canada and the US, to be resettled as refugees. The true story behind their evacuation by Israel and their proposed “resettlement” as heroes is one of the most devious and frightening tales of our time. Sources also tell us that among the 800 are top ISIS commanders who will soon be living in Germany, Britain, Canada and the United States, doing what terrorist commanders do, organizing cells and murdering innocent civilians, just like they did in Syria and Iraq and just like the White Helmets had done all along. The White Helmets are an enigmatic group, lauded as volunteers and life savers, servant of mankind, they were organized by Britain’s MI6 as a black propaganda and anti-Assad organization funded by the governments of Britain, the US, Germany and others. They are not an NGO. There is nothing “non-governmental” about them. Essentially, they are terrorist mercenaries. 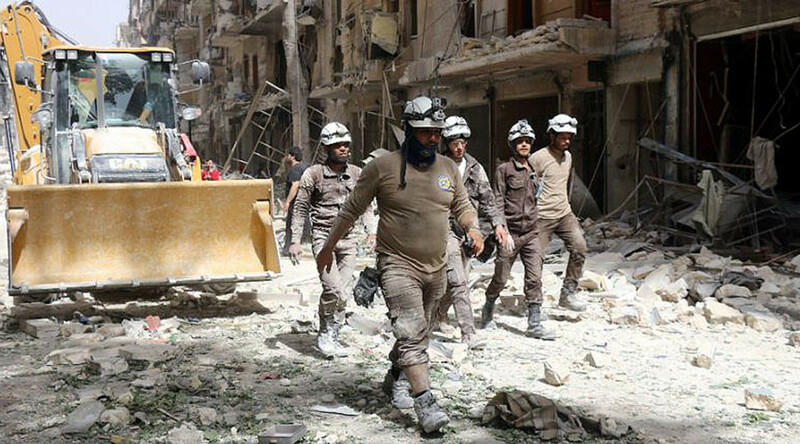 With up to 30,000 opposition fighters inside Syria giving up arms and either rejoining Syrian society under the Damascus government in the last 12 months or for some being resettled and perhaps continuing the fight, the 800-man force known as the White Helmets is unique. Perhaps this is why they had to be “disemboweled” from Syria through an illegal military incursion that to the trained observer also demonstrates the curious close relationships between ISIS, al Qaeda and the Israeli Defense Forces, almost as if they were one in the same and the White Helmets were simply just another ISIS or al Qaeda organization. It was the White Helmet’s fabricated stories of gas attacks and “barrel bombings” that drove Donald Trump to call the elected Syrian leader “animal Assad” and launching multiple strikes on Syrian territory without UN authorization or NATO consensus. It was the same Trump advisors and the same Donald Trump who now says he believes President Putin that, not so long ago, took the word of perhaps the sleaziest of all CIA terror operations, the White Helmets, a CIA he now says has always misled him, has always been useless, as justification for attacking Syria. Why then did Trump attack Syria when the information he based his decision on was, by his own admission, “fake news” from his political enemies. Taking it one step further, not just fake but crazy as well, with Syria triumphant on the battlefield. Syria had warned the world that the White Helmets were preparing a provocation in order to justify an American defense of ISIS against a Syria more united than ever under President Assad. That news was everywhere, certainly across the international and alternative media that Trump is known to monitor nearly 20 hours a day on his smartphone. How did he miss it? One thing the world now knows beyond a doubt is that Donald Trump believes Vladimir Putin. But if this is true, which we know it to be, then Trump’s actions regarding the White Helmets are bizarre and even criminal. Let us take a closer look. On July 18, 2018, President Donald Trump and Canadian Prime Minister Justin Trudeau phoned Israeli Prime Minister Benjamin Netanyahu. They asked that Israel send IDF units well into ISIS and al Qaeda held territory, into Syria, in violation of the 1974 cease-fire agreement. There, the IDF was to, in less than 4 hours, screen 800 adult males claiming to be “White Helmets,” along with their families, load same onto buses and drive them to CIA controlled training camps in Jordan about 50 miles south of the recently liberated Syria city of Daraa. The planning and execution of this effort, in less than 24 hours, was both incredible and heroic. Israeli forces met absolutely no resistance from ISIS or al Qaeda but were, rather, greeted with full cooperation and open arms. Let us remember that, only a week ago, American President Donald Trump met with Russian Prime Minister Vladimir Putin. Trump was effusive in his praise of Vladimir Putin, particularly in his trust of Putin and Trump’s belief that Vladimir Putin is an honest man. This being the case, one can’t help but wonder why President Trump would ask Israel to rescue the White Helmets from the Syrian Arab Army. Moscow has stated for many months that the White Helmets are, in fact, a terrorist organization and has offered proof at both the United Nations and at The Hague backing its assertions. In fact, the White Helmets, supposedly a civil defense NGO made up of Syrian volunteers, has long been exposed by journalists like Vanessa Beeley, Nahed al Husaini and Carla Ortiz as guilty of the murder of thousands of Syrian civilians through staged gas attacks and bombings. The White Helmets, lauded by American leftist and Hollywood actor, George Clooney, have been cited in the media, particularly in Russia, Iran and Syria, but other nations as well, as among the most dangerous terrorists in the world. Why then, as Trump has stated he values Putin’s opinion so much, and this is a case where Putin’s opinion is backed up by significant and irrefutable evidence, has Trump done something so stupid? You see, it isn’t just that Trump and Trudeau asked Israel to send troops into Syria in violation of UN agreements and Syria’s sovereignty, a war crime in itself, but Trump and to a lesser extent for Trudeau, knowingly asked Israel to aid terrorists who are guilty of crimes against humanity. According to the German newspaper, Bild, the White Helmets, 800 so far, will be sent to Germany, Britain, Canada and the US. There is considerable evidence that this is an army of “800 little bin Ladens,” with many trained bomb makers, nearly all jihadists and most minimally need to be adjudicated as to their crimes against the Syrian people. Additionally, one might well note that no screening process was employed whatsoever. We are certain that Israel simply loaded anyone who showed up onto a bus. Let’s take a second and picture this. We have 800 families who traveled to an embarkation point deep inside the ISIS enclave in Southern Syria, an enclave shrinking by the minute. ISIS fighters are all around, flags and guns, many carrying their head-chopping swords, others with cameras and phones, recording and uploading events to their YouTube channels and Facebook accounts that are never cancelled no matter what kind of material they post. Alongside them are IDF units, in uniform, armed, standing side by side with ISIS fighters while dozens of buses are driven in from Jordan. Does anyone find anything wrong about this picture? Do I have something wrong here? How was this going to be sold to the public when these ISIS terrorists show up at the Toronto or Indianapolis airports and are rushed through customs and into their new lives, paid housing, free medical care for life, government checks in the mail, their children not seized, no danger of deportation and detention. Does anyone find anything wrong with this picture as well?